Richard at the Taj Mahal during one of his former delegations to India. Richard Pena has spent a lifetime advocating for the rule of law—in the United States and throughout the world. He is a former President of the American Bar Foundation and State Bar of Texas and served on the Board of Governors of the American Bar Association. 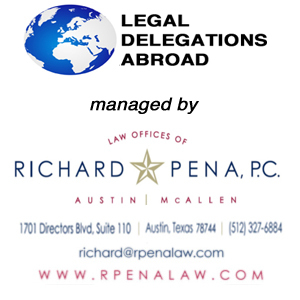 More information can be found on his law firm’s web site at www.rpenalaw.com He has led numerous delegations of lawyers and guest to other countries in international exchange programs. The programs focus on comparing rule of law issues with legal colleagues around the world while at the same time learning about other cultures. He was chair of the Leader Advisory Board of People to People Citizens Ambassador Program, an incarnation of an initiative founded in the fifties based on President Dwight Eisenhower’s belief that communicating with other countries can foster peace. He currently is Special Assistant for Legal Program Travel at Academic Travel Abroad. The first of 17 legal delegations he has led was to China in 2000. Since that time he has led delegations of legal professionals to places such as Tibet, Vietnam, Cambodia, Egypt, Israel, South Africa, Cuba, Russia, China, India, Brazil, and Turkey. This blog commemorates the legal delegations Richard Pena has led. The primary professional objective of the delegation is to develop an understanding of rule of law and attorney issues in the countries we visit. We also go in the hope of strengthening and supporting the bond between the legal communities of our two countries and when necessary to provide support for rule of law struggles.